Cattle grazing proved to be important activity and work that will continue to exist until doomsday. Most human beings regard it as a lowly and ancient work so much abandoned. Though of course in the current era technology devices can be used to facilitate grazing, one of which is with IoT (Internet of Things) which is also widely applied in some areas of life. With cattle grazing turns out one of the important things for human that the cycle of food can run and continue (sustain). Soil fertility will be preserved, then grasses can continue to grow as well as various other trees. It is Allan Savory, a biologist from Zimbabwe who formulated the phenomenal concept of saving life on earth through Holistic Planned Grazing, a simple concept of planned grazing. The concept has even been applied in various parts of the world, ranging from Africa, Australia, Latin America and even North America with a total area of ​​more than 16 million hectares (about 40 million acres). How the grazing system so that it can save life on earth, watch the video of Allan Savory is in this link. The principle is to plan the rotation of the cattle grazing periodically so that the distribution of livestock manure to a large area and the grass in the pasture area has not been exhausted has been abandoned by cattle grazing, and then each area is visited again when the grass has been restored. Masha Allah. It proves and convinces us that what all the Prophets and Messengers of Allah do, we are worth imitating until the end of time. But there is a difference of cattle that Allan Savory used with Allah's prophets, Allan Savory used cows while the whole Prophet was grazed sheep or goats. Why did all the Prophets graze the sheep and not the cows? Allah Almighty who sent the Prophets certainly has a purpose with it and certainly contains a lot of wisdom in it. Some of these wisdom, among others, first, the mathematical proliferation of sheep much faster than cow. A single female sheep or goat can give birth to six lambs in two years, while a cow gives only one or a maximum of two at the same time. Second, sheep or goats with smaller sizes are also more mobile in spreading dirt so that fertilizing effects on the soil are also more evenly distributed. Third, the quality of sheep dung as fertilizer is also better than cow dung, especially on the macro content of nitrogen (N), phospur (P), and potassium (K). Because the result of ordinary human works, Savory approach is certainly still contain many weaknesses, but it also can save the area of tens of millions of hectares in the whole world mentioned above. 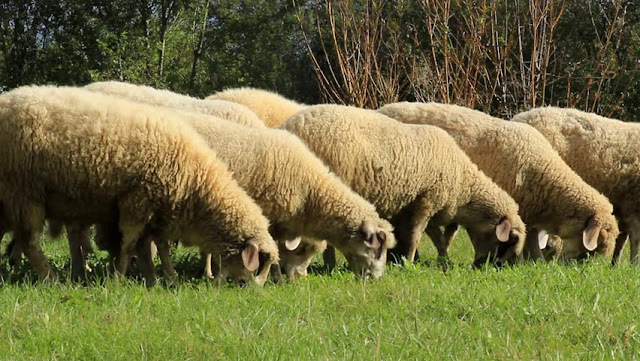 What if the example of the Prophets with the sheep grazing is applied all over the world? Of course the result will be much better in all aspects. The harvesting rotation in energy plantations can also be adjusted with rotation of sheep groups in the grass area. The location of trees in the energy plantaion that is ready to harvest with the grass below can be used for sheep grazing. Trees that are high so that the leaves are not reached by the sheep, so as not to damage the trees. After the wood is harvested and leaves separated, then the leaves are also feed the sheep. The grass and the plantations will be pleasing to the sheep and sheep owners. The low production of our meat, the low consumption of meat per capita and the high import of meat is our problem today. Indonesia's meat production currently stands at 2.5 million tons and that is to keep the 10 kg / year per capita fulfillment for 250 million people. The consumption of Indonesian meat is low, only about 1/4 of the world's consumption average, which is around 40 kg / year per capita. These protein pads are essential for cell growth and intelligence. 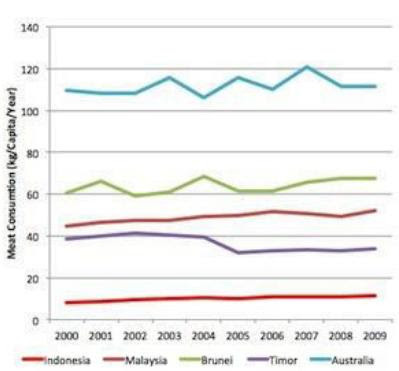 FAO recently released its statistics that Indonesia only consumes 10 kg / year of per capita meat while our neighbors such as Timor Leste are 36.51 kg, Malaysia 48.93 kg, Brunei 63.87 kg and Australia 111.72 kg. Why did it happen? Are our vast and fertile lands insufficient to reach conditions equal to the world average? There are at least three causes: we leave the sunnah of the Prophets to graze, wrong in choosing a grazing animal and mindset in grazing locations. Sheep or goats are supposed to be the best grazing animals. For the third error is the mindset about grazing sites. "He Who has sent down rain from the sky for you, part of it to drink and partly (fertilize) the plants, which on which you are grazing your cattle "(Surah 16: 10). Again we get a hint from the Qur'an that the best grazing sites are not in the vast pastures of Australia and New Zealand, but among the shade of other plants that form dense plantations such as energy plantationns. Which country is best suited for it? Tropical country like Indonesia is the right and best for grazing. Besides Allah also commands us to pay attention to our food (QS 80: 24-32), both the substance (quality and quantity) is also how to get until to process it. By eating food that halal thayyiban then our prayers are also easily granted Allah SWT.